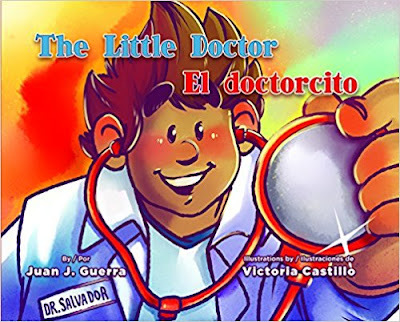 Guerra, who is an ob-gyn physician in Oakland and co-founder of Salud en Español, a clinic for the Spanish-speaking community, conceived of and wrote this quasi-autobiographical story to encourage children who are bilingual to think about entering the medical profession. Unfortunately, The Little Doctor / El doctorcito is fractured and contrived, and does little to communicate this valuable message to young readers. Ten-year-old Salvador has just earned an A+ on his fourth-grade science test, and rushes home to celebrate with his abuelita, who greets him with a request that he accompany her to the community clinic in order to help her “speak English” (translate for her). The child enthusiastically welcomes the chance to help his abuelita, telling her on the way that he wants to become a doctor. Then he storms out the door, slamming it behind him. First, no responsible physician would instruct a young child to translate and explain a serious medical condition such as “high blood pressure” to a parent or grandparent; this is something the child might not understand and would probably not have the vocabulary to translate, not to mention explain. And second, this racist, reality-challenged doctor—who assumes that all Spanish-speaking people are Mexican, grandma doesn’t eat any fruits or vegetables but she eats too much Mexican food (all of which is unhealthful), nor does she take medicine—loudly instructs this child to disrespect his own grandmother. Moreover, in Abuelita’s case, a doctor or nurse would be likely to find out why she has high blood pressure: Do other family members have high blood pressure? What’s her diet like? Is she taking other medications? Does she exercise? But the over-the-top behavior of this doctor is beyond the pale and confusing to young readers, especially to young Latinx readers. 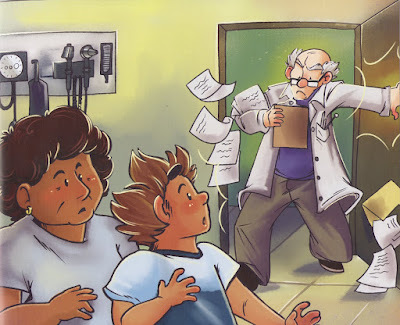 While Salvador responds to the doctor’s assumption that the family is Mexican, he doesn’t question any of the other assumptions. Of course, as a young child, he wouldn’t; but again, the child reader will be confused. This failure, along with many others, is built into the story. Depending on necessity and circumstance, people in El Salvador often see both physicians and curanderas. But readers at first learn that, whenever Abuela felt ill in El Salvador, she saw a curandera or drank herbal tea. And later, an upset Abuelita remembers, “Salvadoran doctors listen. They want to know about you and how your family is. In El Salvador, the doctors really care for their patients!” This “either-or” rather than “both” paradigm is confusing as well. Salvador’s experience in this overcrowded clinic in which there are no Spanish-speakers is now convinced that he has found his life’s path. Abuelita’s young translator now assures her that he will never take her to see another abusive doctor like the one they’ve just encountered “ever again.” And his parents remind him that he’ll have to “work very hard” to bring his dream to reality. [He] imagined the amazing journey of becoming a doctor, wondering about mysterious and marvelous places like college and medical school. He envisioned a world with doctors who looked like him and spoke English and Spanish. Knowing that his magical adventure would begin the very next day, Salvador drifted off to asleep [sic]. Doctors practice all over the world, and in many places, people see both traditional healers and physicians. While years ago, medical translators were nonexistent or rare, most clinics now employ both medical professionals and translators who speak the languages of the communities. But there are some cases in which a translator may be unavailable, and this story could have been about not having enough Spanish-speaking doctors, but that’s way different than Salvador’s situation. It's clear that Castillo is a talented illustrator and comic artist. In a different story, her vibrant, cartoonish art, in pen and ink and digital watercolor on a bright palette of mostly reds and oranges, would shine through and easily capture a young child's imagination. But here, they are discomfiting exaggerations of what might have been tender scenarios in which young Salvador is translating and being generally helpful. For instance, in a scene where he is helping a nurse who is assisting a patient in a wheelchair, the nurse is smiling at Salvador rather than looking where she is going, shielding her patient from the rain by holding an open umbrella under her left arm and struggling to steer the wheelchair with her left hand while also struggling to keep a heavy door open with her right hand. Salvador is opening the other heavy door for her. This kind of problem may have been typical more than 20 years ago, but today, most hospitals and clinics are equipped with wheelchair ramps and automatic doors. There are many stories that could have been—and should be—written about real situations involving children’s translating or interpreting for family members. And there are many positive potential scenarios about children’s desires to become community physicians and how these desires might be encouraged. This could have been a story about something positive happening that convinces a child to want to become a doctor. Baeza Ventura’s excellent Spanish translation, in many cases, reads better than the English text. For instance, an English passage reads: “Salvador knew that everything was now up to him,” and Baeza Ventura’s translation reads: “Salvador sabía que todo estaba en sus manos.” But it’s not enough to save this story. Rather, The Little Doctor / El doctorcito is a stereotypic mishmash with lots of contradictions and distractions and little to recommend.